Martian pres. Robots On Mars - Element 115 [Interstate] | OUT NOW! Thread: Martian pres. 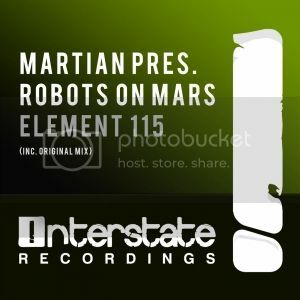 Robots On Mars - Element 115 [Interstate] | OUT NOW! 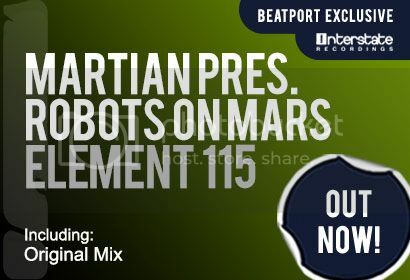 Continuing to create waves in 2013, rising star Martian returns to the stable under his ground breaking Robots On Mars guise with the monster hit ‘Element 115’. Driving techy goodness from the off with a killer, hypnotic bass line and groove. The track builds into a frenzy with its tech fuelled percussion and moody lead sounds. Look out for the break with its deep, dark atmosphere before delivering that killer drop, injecting a euphoric rush of adrenalin as it kicks back in and takes no prisoners. Hold onto your hats because this is about to cause some serious club carnage!